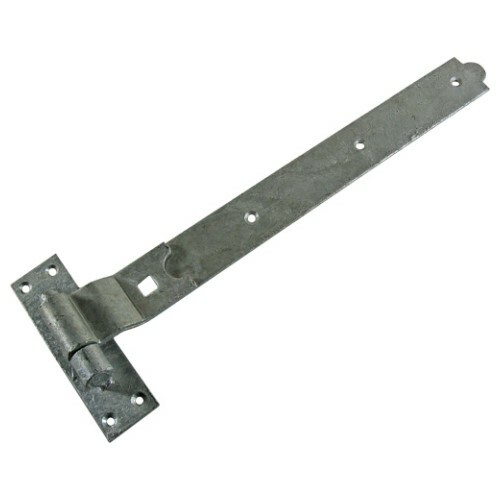 English pattern Cranked Hook and Band (Pintle) Hinge for general purpose use. Manufactured from heavy gauge mild steel for more demanding applications and suitable for heavier doors/gates etc up to 36" (900mm) wide. A popular choice for agricultural buildings, garage doors and heavy gates. 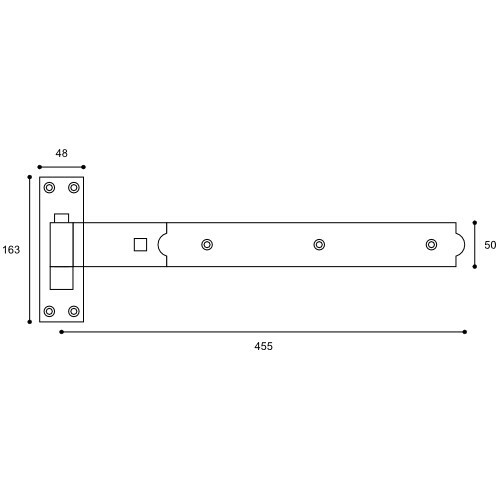 Hook & band hinges are designed to be fitted to the opening face of doors with both the horizontal strap and vertical frame plate being visible when the door is in the closed position. As a rule of thumb, light to medium weight doors (soft wood, pine) will require hinges approx one third to half the door width. For heavier doors (eg solid oak) select a hinge one half to two thirds the door width. 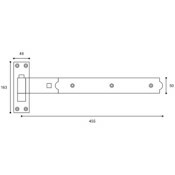 For doors over 84" (2100mm) high we recommend a third hinge fitted centrally. This is a "cranked" hook & band hinge that requires the door to be flush with the frame for correct fixing. You should also ensure that your frame post is wide enough to accept the fixing plate. Finished in hard wearing Hot Spelter Galvanised for external use in normal conditions. NOT recommend for coastal areas or other harsh environments. Lubricate immediately after fitting and periodically thereafter - at least twice yearly. Clean with an oil impregnated cloth to remove harmful deposits. Two hinges (one pair) complete with all fixing screws, bolts in matching finish.